BJP – POORNA VIRAAM ! 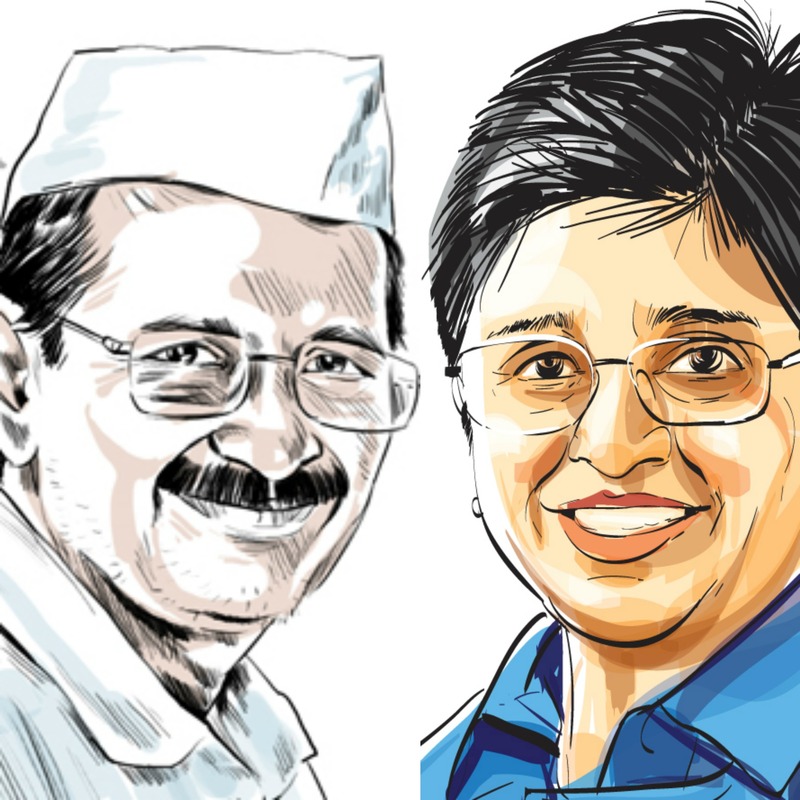 For AAP and Kiran Bedi – Its “Do or Die”! Amidst BJP’s marketing fanfare, AAP’s grassroots connect, Congress’s submission and Issue-bereft personality-led Delhi elections, I find majority of voters undecided! Nevertheless whosoever wins, I find these Delhi elections “Do or Die” for “Kiran Bedi” and “Aam Aadmi Party (AAP)”! If it would have been any other election, the losing parties always have an opportunity to rebuild their party using its strong organizational base and vie for the next elections by being a strong opposition. They also have other avenues by contesting elections in other regions and stay relevant. The losing leader too commits him to the organization, as he had spent years into the arena, climbing up the ladder and to be at the helm of party politics. In this case, can both politically novice, AAP or Kiran Bedi convert this fad into a cult? Have the forthcoming loser, either Kiran Bedi or AAP, thought about its political life beyond these elections? Because, believe me or not, I foresee either of them dying of their own sword. “AAP” was an idea emerged out of “India Against Corruption” campaign to break away from the conventional politics run mostly by the corporates, corrupts, criminals and godmen. These torchbearers of alternative politics had given a new hope to many voters as being harbingers of change. But being a very young and small political party with Delhi being their only political foothold, AAP cannot allow itself to lose these elections. Because if they do, their party may crumble with internal clashes and resignations. AAP would not be able to even dream being in power anywhere till 2019. Powerlessness and Hopelessness would test each one’s loyalty and commitment to bring change in Indian politics. In the past as well, AAP had been creating headlines for its questionable organizational skills and nonsensical political strategies. Hope AAP leaders have chalked out their plans as a unit, beyond these current Delhi elections. For Kiran Bedi, she have been avoiding entering into the electoral politics. Desperate BJP lured her into politics, with the CM position, and she grabbed the opportunity. Who in the world doesn’t salute to the rising sun? Kiran Bedi would have thought it to be a cake-walk, a safe bet, to debut as a Chief Minister in politics, from a party who is on a winning streak across India. But what if AAP stumps them? Would Kiran Bedi sit as an opposition leader for 5years and be irrelevant ! Or she would be absorbed by the BJP Central Govt., ditching it’s Delhi voters, who assumes her to be with them through thick and thin. Or she would be used and then thrown into dump by the BJP itself, reducing her persona to nothing. Politics is not only about being in power or planning for the event called elections. It’s a journey of untiring selfless public service and not the destination of designations. Politics is about being on toes, if being in power. Or keeping the government on its toes, if in opposition! Personally, I believe in Ideas, Policies and Processes over People. One Kiran Bedi may come and go, but the idea of AAP shouldn’t die an early death! “Modi Sir” – A Good Idea with Doubtful Intentions! On the eve of Teacher’s Day (5th September) in India, Narendra Modi Government decided to reach out to “All” the students in India, through every school and live interactions. All earlier Indian Prime-Ministers (PM) have been interacting with few selected school students in a formal set-up, on every Children’s Day (14th November). It was a brilliant idea, to take the message across, from leaders like Modi (for his great oratory skills), to each and every school student in India. With the advent of technology, interaction with the Prime-Minister of India shouldn’t be for few fortunate (though bright) kids. Earlier PMs have had been exercising this constructive activity, but never envisioned it to be a great PR opportunity. PM Modi’s team, through this interaction on Teacher’s Day, helped adding more feathers to the Modi’s brand image. Though from a bird’s eye view, it all looked inspiring, yet there seems to be an underlying attempt of political vendetta. Amusingly and questionably, why Mr. Modi and his team chose to interact with children on a Teacher’s Day? Teacher’s Day is the day to appreciate and express gratitude to all the Teachers across India. Earlier PMs used to award outstanding Teachers across India, on this occasion. To interact with children, just 2 months away, we have “Children’s Day”. Mr. Modi could have also planned this interaction on Children’s day? And here enters the politics. 14th November, “The Children’s Day”, is also the birthday of India’s first PM, Jawahar Lal Nehru or Chacha Nehru. And incidentally, this year, will mark 125th Anniversary of Chacha Nehru. In an attempt to decimate both the Nehru legacy and “Nehruvian” ideology (and Nehru family too), I believe Mr. Modi preponed this interaction with children. As much as I know of Mr. Modi, he would either like to make 14th November a hush-hush affair, or would escalate his brand Modi into “Chacha Modi”. Mr. Modi should focus in creating his own persona through his actions and efforts, and not by erasing the legacy of past great leaders. Nehruji, even though a political opponent of RSS, is among the greatest Prime-Minister we ever had, and should be treasured. I am keenly waiting for 14th November this year, to see if my political reading goes correct. Although “The Cynic” in me, loves to get surprised, by Mr. Modi, every time. 100 Days of Obsolescent Congress ! While the TRP-hungry Indian media is busy analyzing the meagre 100 days of the mighty Narendra Modi Government, I decided to look the other side of the coin. Indian National Congress, as a political organization, also completed their 100 days of devastation, powerlessness and cluelessness. The lethargic Congress Working (pun intended) Committee has neither shown any zeal nor any intent to reinvent themselves. They have still not even hinted their sympathizers, on any alterations, either in their leadership, or structure or communication etc. It seems, they are neither planning, preparing nor willing to win the upcoming assembly elections in Maharashtra, Haryana, and later in J&K, Bihar and UP. Another washout for Congress in these elections would not at all be surprising. Even as an opposition, be it in parliament, news-channels, social-media or streets, Congress finds itself unnoticeable. Congress representatives (barring Tharoor’s of the world) still witless and sometimes regressive, though mostly humbled (thankfully), after massive defeat. Spokesperson, still spoon-fed by the Old Guard, are surely “Young” but they do not represent the “New”. They are “Fossiled” to past, both in content and in person! Although the BJP Government (and not Mr.Modi) and their mouthful friends, have provided enough political opportunities to latch upon, yet Congress failed to materialize any issue. If things remain the same as they are now in Congress, very soon, the political prowess of Modi-Shah duo, will be penning down the last chapters of Indian National Congress, a political organization, which once existed. Breed of Online Political Activists ! Indian democracy was in shambles in the 1975 Emergency Era. Tsunamis of Indian, led by Jai Prakash Narayan, were on the streets protesting against the autocratic regime. The movement fought on streets against the darkest phase of independent India, led to the dawn of first breed of political activists post-independence. The long list included Atal, Advani, Modi, Nitish, Jaitely, Laalu, Mulayam, Sushma, Rajnath etc., who in future were the shining stars of Indian political spectrum. India is yet again, echoing the history. New breeds of political activist are getting life, this time not on streets, but through social media. India was still the place where patience resided till 2009. Social media was distant tool and was best consumed in the form “Orkut”. The mutiny against the corrupt regime, was fought on “Facebook” and “Twitter”, and was led by Aam Aadmi Party and Narendra Modi led BJP. Facebook and Twitter gave a platform to urban India to voice their opinions. Facebook and Twitter allowed resentful Indians to protest anytime, anywhere, against anybody, without disconcerting their comforts or by shouting their throats off. Emergence of social media hustled the emergence of newer breed of political activists. Not debunking it as a fad, but by considering it as accelerating activism, Indians would express their opinion more actively and prominently in days to come. Who knows, with continuous progression, 20 years ahead of today, you, me, he or she, may make mark in Indian political spectrum. Good Days Are Ahead ? Don’t Give Me “Reasons”, Give Me “Results”! The mentioned phrase is commonly used in most business organization to keep pushing their employees, for higher sales, revenues and profits. UPA II led by Indian National Congress, in their last leg, provided all sorts of excuses for policy paralysis, but results. Indian voters, hungrier than ever for growth, will not tolerate any more excuses for failure. Neither the “Indian Growth Story” can afford any reasons for derailment. With high hopes, a decimated opposition and a mammoth mandate, India has chosen Mr. Narendra Modi, as their infallible CEO. Indian voters have brought necessary change in guard, with almost everyone voting for them, farmers, laborers, middle-class and the richest too! India expects their “Super-Hero” Prime-minister, to propel Indian growth engine to newer orbits. And this time, unlike UPA I and II, they wouldn’t have any excuses, for not achieving it. This time, the BJP led government under Mr. Narendra Modi has no coalition pressures to blame to. With fragile opposition, neither they are expected to build consensus first for difficult decisions. The new government has unwavering Industry support too, to take bold decisions. Everyone expects this government to take courageous and necessary steps in next two years itself. This is to counter the electoral impact, as the following 3 years can help cooling off the short-term negative impacts. Moreover, every organization/economy/country experiences inevitable business cycle with crests and troughs. India at the deepest end of this cycle is expected to grow up the ladder anyhow (though better governance could enhance the speed). No new global recessions are in foresight, neither a military war nearby; India is ready to hit its 5th gear. I understand that the expectations are idealistic, but so were the promises! Also, there could only be two reasons, I can think of, which could trump the performance of the Modi government. First, either lack of talent,skill or integrity in ministry-hood or the second, the social/religious discords in the country, which could create a hostile business environment. I hope neither of them comes true for Mr. Modi, and neither would he fuel them through his actions and inactions. Visualizing all this, I am assured, that only “Good Days are ahead” for India! Development, but at what Cost ? India has been voting on the issue of development since last decade. BJP’s “India Shining” bombed, as back then, India was shining only in Media houses. Atal Behari Vajpayee and his brilliant team (Jaswant Singh, Arun Shourie, Brijesh Mishra) failed into the hands of RSS and Hindutatva agenda. From 2004 to 2009, India grew well both economically and socially under Manmohan Singh, and India voted them back on the agenda of development, with higher mandate. Now, again in 2014, it seems India is again voting on the agenda of development. And the man chanting that word the most is Narendra Modi. But, I have a question! India needs development, but at what cost? During Congress regime from 2004-2014, India developed, managed recession and brought in social reforms. But we Indians paid a heavy price for it through “Corruption”. India is looking forward to Narendra Modi’s BJP, as he promises to speed up the India’s growth engine and bring prosperity to the nation. Considering his promises to be true, it may heavily cost us Indians into Moral Policing, Conservatism, Non-pluralistic visions and Social Dissonance. And who can guarantee that the government under Narendra Modi wouldn’t indulge in corruption, crony capitalism and scams. In the haste of achieving high sensex figures, lets not lose our ethics and social harmony. If you and fellow Indians are ready to pay that price for development, go and vote for Narendra Modi. Also for those, who are voting on the basis of religion, caste and creed, please go find another country for yourself. Open Letter to Indian Voters ! Hope you are not voting for somebody because you think, everyone is voting for him. Or because there is wave. Or because media, friends, family or society around you says so ! Be not of herd mentality ! Especially women ! Hope all Indian Women eligible for voting, are voting based on their choice and beliefs ! And not because their Father, Husband, Family etc. told them to vote for ! Be Independent ! Just listen to your heart, and vote ! Why India should vote for BJP in 2014 Elections! 2014 General elections are not too far, and political parties have started their drum beating acts, vilification and slug-fest. Voters either already have or are in process of aligning themselves to preferred ideologies, leadership teams and parties. Sooner or later, even I had to announce my loyalties for the forthcoming elections. Though I am not fully convinced, but still, here are the reasons, why India should vote for BJP this time. Seems like majority to Indians (especially on Social Media) are at their heights of Cynicism. They are in no mood to trust our Media, Government, Institutions and Politicians (except “The Saheb”). Pessimism is spread among the urban Indians like a wild fire, and the credit goes to both UPA and BJP. UPA Government through their unwanted actions and desirable inactions, have raised several doubts on the theory “India: The next Superpower”. And BJP, backed by RSS, also to be equally blamed, for their vilification tactics using social media and pracharaks! And the only way to transpose them from Cynicism to Realism is by bringing “Change”. Congress has lost any sought of trust in the Indians. Flurry of scams, minimal communication with the public, perceptive spineless leadership and opaque decision making have crashed their popularity index. All the decisions, statements, views of their leaders are seen with suspicion and usually termed as political opportunism. They have lost their moral ground to even criticize their opposition on every aspect be it economics or governance and more so, on the secularism. More so, Congress is been in power for 10years now, and fatigue factor is overpowering Indians, and thus considering change. Although all the political parties have deleterious baggage of their past, but “The Recency Effect” goes against Congress too. The only political party which seems to “substitute” them is BJP, considering AAP being too small. AAP also lacks the governance experience and the political muscle to win seats in 2014. As of now, they can be a good opposition party, if not more. Indian economy needs a stable and decisive government, even if affects the social fabric of India. India needs quick economic, social and agricultural reforms, which only a stable and decisive government can provide. Federal parties don’t seem able enough to provide stability due to internal political tussle and deficiency of national approach to India’s problems. Thus we are left with no option but to vote for BJP. The new-age India would now vote the basis of performance (economic and social). Congress and many other parties would soon realize that their style of traditional politics is now obsolete. Also now it’s high time for Congress to move beyond Gandhis and the Oldies. Thanks to emergence of AAP and BJP’s marketing strategy (based on their state Government’s performance), Indians would soon disown dynastic, corrupt and criminal leaders from politics. To start with, I would still believe, India should vote for BJP minus Mr. Narendra Modi as Indian Prime-Minister. But since, now their paths are aligned, this possibility seems hypothetical. Meanwhile, Indians overwhelmed by the Modi-Mania are dreaming of a mystical world with Mr. Modi with a magical wand, which would solve all of India’s problems, as he did in Gujarat. Many Indians are into idol-worship of NaMo, and see no wrong in the Mr. Modi. Let not their dreams not be shattered. Mr. Modi, who mirages hope in impatient Indians, for a better future, has outgrown himself bigger than the party. Infact amusingly, many are fascinated with Mr. Modi but not with the party, BJP. Let not their hopes get crushed, because, if crushed, they will lose faith in India’s growth story. If Modi remains “The Un-Chosen One”, India will keep harping on “If”s and “But”s. He should be given a chance to dictate India, because, sometimes, a country needs to go through the holocaust to realize its true character and to rekindle the importance of social framework. Disclaimer: I would still not wish BJP to get 272 seats. A BJP (max 200 seats) led coalition government would keep a check on the right wing extremism in India. 2014 General Elections : One Man’s Race ! Considering Congress’s suicidal attempts and Kejriwal’s accidents… Seems like only one man is running in the PM’s race. Nothing seems like stopping NaMo to become India’s new PM. Subash Chandra Bose’s dream (atleast this one) is coming alive ! Why India is NOT Pakistan? India and Pakistan both got independence from British in 1947. Both countries born together had one struggle for freedom, one civilization, and one culture. Yet after 66 years of each other’s independence, both the countries are poles apart, both economically and socially. As famously George Bush quoted, “I explained that Pakistan and India are different countries with different needs and different histories”! But have we ever thought of reasons behind this anomaly between the two countries, which were years ago so similar, but today completely contradictory? India had assembly of great leaders in 1947, whose visions helped in defining India’s roadmap to recreate an exemplary civilization. Unlike Pakistan, India was lucky to have wise and compassionate leaders like Jawahar Lal Nehru, Sardar Patel, Maulana Azad, B R Ambedkar, S.Radhakrishnan, Lal Bahadur Shastri etc. All these leaders were groomed under Mahatma Gandhi and thus always valued the importance of upholding the “Dharma” (Justice). All these leaders valued the sacrifices of Bhagat Singh, Chandrasekhar Azad, Ashfaqulla Khan, Ram Prasad Bismil etc. and thus vowed to craft India a great Nation. On the other hand, Pakistan’s Muhammad Ali Jinnah lacked both vision and wisdom. He could not create next crop of leaders nor was able to inspire fellow countrymen. Those were days of Cold War between USA and Russia, and all the Third-World countries were aligning themselves to the either superpower. Non-aligned Movement led by Jawahar Lal Nehru with other world leaders, decided to not formally align or go against any major power blocs. Such entrepreneurial and hyperopic foreign policy helped India gain huge respect among the world leaders across geographies. Unlike India, Pakistan chose to get associated with USA and its allies, to receive favors from the economic and military powerhouse. Today after so many years, where India is now highly self-dependent, Pakistan has ended up being a pet of USA (and also China). Pakistan’s impatience to grow faster by aligning itself to USA landed it nowhere. Whereas India grew slowly but surely, leaving Pakistan laps behind in the economic race. Where Pakistan slowly turned into an Islamic country and treated minorities as second grade citizens, India chose “Secularism”. India respected people of all faiths and beliefs, allowing everyone to co-exist in harmony. Pakistan’s transformation into an Islamic country ended up mushrooming powerful religious leaders, which led to rise in terrorism and religious extremism. India, on the other hand, kept a strict check on right-wing extremism of the majority, and also protected minorities through equal justice and supportive policies. Indian governments didn’t allowed India to become a Hindu-Pakistan, and kept restoring the faith of minorities during difficult times. India always ensured equilibrium among all the democratic pillars of democracy which are Judiciary, Legislative, Executive, Military and Media. None of the five pillars was neither allowed to interfere, nor allowed to overpower another pillar. Although being parallel, all the pillars of democracy worked collectively to take India to newer of heights of being a great democracy. Pakistan, failed in maintaining this equilibrium, and thus allowing the Military, several times, to overpower all other pillars of democracy. Pakistan had seen several coups by their Military leaders and even today, none of the other pillars had yet challenged its supremacy. Beyond these key aspects, in last 66 years, India had been through several conflicts and issues. Issues ranged from leadership issues to secularism turned appeasement issues to pillow-fights between democratic pillars to feeble foreign policy issues etc. Yet we all have always been able to overcome all the problems, thanks to our fore-fathers, fellow Indians and leaders. We may come across several new conflicts in our near and distant future. But I am confident, that we “The Indians” will be able to solve all the existing and forthcoming problems amicably. Though sometimes slowly, but surely! Happy Birthday : Father of the Nation ! Wishing a very Happy and Respectful Birthday to our Dearest Mahatma Gandhi ! You were the greatest, bravest and the simplest man India ever had, in recent history ! Unfortunately these days, Social Media and Rightist leave no opportunity to defame you and undermine your importance in Indian freedom struggle. “‘An ounce of practice inspires more than a ton of preaching” ! Har ek subah ki shaam huyi, ! Sita bhi yahan badnaam huyi” !! “बड़बोले” को चुनने चली ! “मैं मैं” को चुनने चली ! “गब्बर” को चुनने चली ! “मौत के सौदागर” को चुनने चली ! “Act” नहीं “Action” को चुनने चली ! “औरंगजे़ब” को चुनने चली ! Perils of not being a Modi Fan ! As India is slowly moving towards its next general elections, political alignments have boiled up ! The current Indian Government headed by Congress has failed at most fronts. Almost into their 10th year of governance, Congress has not been able to intelligently tackle recent economical, social and political situations. Their governance is marred by several scams and more importantly, their inability to communicate effectively with a common man. BJP, India’s principal opposition party’s mascot, Narendra Modi is considered to be biggest contender for the top spot. His credentials as long serving, Chief Minster of Gujarat, are almost impeccable, with excellent development records, with stains of 2002 Hindu Muslim riots. Being a great orator in Hindi language and being technology and business enthusiast, he commands huge following on social media, largely youths of India. But this article is not about Modi’s eulogy or Congress’s criticism. This is about my freedom of expression. Modi-Fans and Anti-Congressmen aren’t allowing people like me to freely express our viewpoints against Modi. No sooner, I write any statement against the Vikas-Purush Modi, than I am labeled as Pro-Congress, Anti-Hindu, Corrupt, Gullible, Anti-Nationalist etc. Any news, criticising Modi, if shared on social media, is considered as a ” Conspiracy by Paid Media” ! If any Anti-Modi views are discussed, they are doubly counterviewed by Anti-Congress views. Our Twitter and Facebook accounts are slammed with hate comments. Its not only me who is suffering brunts of Modi-Mania ! Even L K Advani (Loh Purush), who was considered to be Modi’s mentor, was not spared, when he decided to go against Modi Fever. Highly respected politicians like Nitish Kumar are considered opportunist if they utter any anti-Modi statements. Old BJP loyalist, who dared to go against Modi, are shown exits. News channels like NDTV’s credibility, built brick by brick in 25yrs, has gone for a toss. Highly respected journalists few years back like Barkha Dutt, Karan Thapar etc.are now considered people with hidden agendas. In nutshell. Any and everybody, who questions Modi, should be ready to face heat from Modi Fanatics. Today, on social media, when Indians openly question or criticise the actions and viewpoints of even the greatest men the world has seen, from Lord Rama to Mahatma Gandhi, from Sachin Tendulkar to M S Dhoni, from J L Nehru to Ambedkar, from our Parents to our Teachers. Why aren’t we allowed to even question/criticize Modi. Where Corporates, Institutions, Laws and Rituals are subject to scrutiny, why aren’t we allowed to scrutinize Modi. Today, I see jokes on Mahatma Gandhi, Nehru Family, Prime Minister, friends, families, religions and communities. But I am yet to see a joke on Narendra Modi, on any social/print/tv media. I am afraid my dear friends, that we have created a demi-god of man named Narendra Bhai Modi. I am afraid,what if NaMo ends up being even worse than Manmohan, dooming all your hopes. Germans voted in majority supporting Hitler with huge expectations. And once Hitler got the top spot, he unmasked himself to become the most dreaded man in political history. How great he may be, allow us to review his actions, with a pinch of salt. Allow us to criticise and applaud any and every viewpoint, be it Congress or Modi, be it Secular or Extremist. Allow us to be fence-sitters, and not label us as Congressmen or a Modi Fan. We do not wish to take sides. Instead, we wish to dissect every news through our knife of cynicism. © COPYRIGHT VIBHOR MATHUR. ALL RIGHTS RESERVED.